We ❤️ all the #Bookstagram photos. We spend hours just staring at all the beautiful books. So we thought we’d spotlight a few of our favorites each week. Check out some of the gorgeous books we found on Instagram this week! I stood the book up on the table and was planning how I was going to take a photo of it when my cat jumped up and started looking cute next to it. The moment I pulled out the camera she looked straight at me and gave me this look. 😂 . .
Because we couldn’t agree more… We all need a Daemon Black to bring us strawberry milkshakes, chocolate chip cookies, and to stalk our blog! Why don’t I have a Daemon Black in my life who brings me strawberry milkshakes, chocolate chip cookies and secretly stalks my blog. Life would be amazing if that happened! • • I’m hoping to finish Obsidian super soon! I’m really enjoying it so far but February is just flying by. I’m aiming to finish it tomorrow and start Clockwork Angel! • • Also, my Top 5 Wednesday post will be up on my blog a little later tonight. Yes, I know, It’s Thursday. I started drafting it last night and never finished it. But, it’s going to be a good one. Be sure to check my story for an update of when it goes up! We weren’t the teacher’s pet either…but this picture puts @lisa_lostinlit in the front of our class! 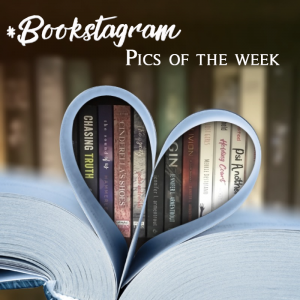 What were some of your favorite #bookstagram photos this week? Share a link to the photos you think deserve to be moved to the head of the class in the comments!